Stonehenge in a Teacup, England in a Nutshell! “My boyfriend went to Scotland for a month and saw the Pictish stones, and I did a reproduction of these amazing ancient stones for him. 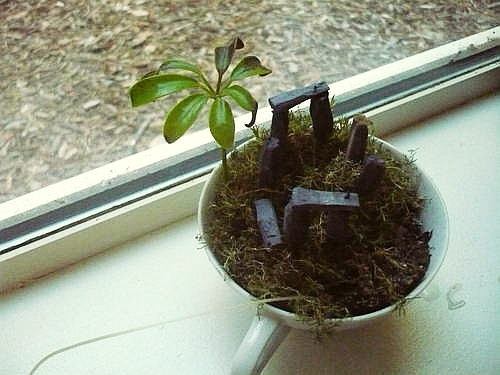 While I was at it I made myself a stonehenge in a teacup.” That’s how Caitlan explains her venture into the rarified world of megalithic mini-gardening, or pseudo-megalithic mini-gardening, or maybe minilithic teacup gardening? Well done! What are the English besides Stonehenge and tea? Although as one commenter suggested, it would work best if there is a picture of the Queen on the teacup! We were tickled to see that the whole thing was inspired by the Stonehenge mini-garden built (planted?) 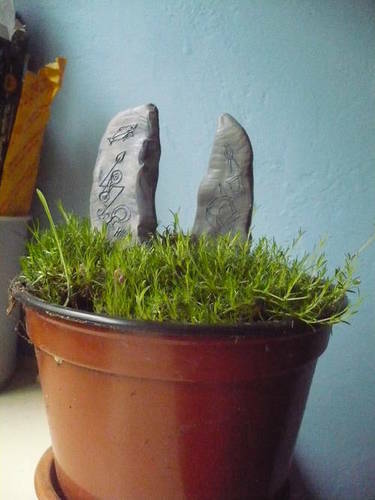 by the inimitable Janit Calvo of Two Green Thumbs Miniature Gardens, a friend of the blog. One Stonehenge replica inspires another. Stonehenge has perfected a unique and successful reproductive strategy seen nowhere else in nature, that of mind infection, and we see it at work here. It seems by the comments that most Brits were not offended, but actually liked the visual shorthand here proposed for their culture. Still, just in case, Caitlan offers a salve: “(I know that’s not all there is to the UK!!! Feel free to make a washington monument obelisk in a mcdonald’s fries carton, it would serve me right. )” It just wouldn’t look as nice on the windowsill, though, would it? Making it even more accurate as a representation . . . Score for the teacup henge: 6 druids. It’s only two trilithons and a few stones thrown in, but it has charm and, of course, moss. We liked it the moment we saw it. Maybe we’ll make one ourselves and save the plane fare. It’s exactly like being there! The Pictish stones garden made for the boyfriend, also nicely done! ← Pastels, Peeps, Bunnies, and Violent Death–It Has to Be Spring! Wonderful! I look forward to seeing your version! I can see I’m going to have to have a go at making one of those. Yes this is simply delightful. But as you pointed out it always helps that it has moss. What a cute little cuppa Stonehenge! Love that it’s carved out of balsa wood – great job!